Horticultural lighting has recently seen rapid growth, especially as horticultural LED and LED grow lighting systems have become more mainstream. New products regularly released in the LED industry, and an increasing number of urban farmers—and individuals able to farm from less traditional or less fertile locations—join the market every day. As such, the focus of the industry is shifting. Horticultural LED systems no longer need to simply function, but must be able to tailor and fine-tune lighting recipes to grow plants more efficiently. Plants need nutrients, air, water and the right temperature to grow. LED grow lighting helps achieve these growing conditions, but with less energy and better overall yield than traditional grow lighting systems. This is because LED lighting can be dimmed, tuned and tailored to fit the specific needs of different crops. GRE Alpha boasts a wide range of powering and lighting control solutions for horticultural and grow lighting applications. Lighting environments require stability and often must operate at elevated temperatures—temperatures that are ideal for plant growth conditions. GRE Alpha’s LED powering solutions provide a robust and flexible power platform for powering horticultural LED, and lighting control models can be further added for color tuning applications. The horticultural lighting solutions provided by GRE Alpha offer universal input (90-305 VAC), 60W to 300W multi-channel output options, 60 degrees Celsius/140 degrees Fahrenheit operating temperature without de-rating, IP65 splash-proof and moisture-proof design, user-adjustable output current and voltage, high efficiency design to maximize photosynthetic photon flux (PPF) and available color tuning module upgrade. The products are also UL/cUL Class 2 listed, PSE and CB registered, and fit well in grow lighting, horticultural LED and constant voltage (CV) and constant current (CC) applications. One such product in the GRE Alpha horticultural lighting suite is the easy-install XLD Series—the industry’s first and only UL Listed LED driver that supports both CC and CV mode operation and can work with a wide range of temperatures. The XLD Series features universal AC input, integral wiring compartments for reduced installation costs, user-adjustable output voltage and current, 1-10V dimming options with the SLD Smart Dim series dimming module, up to 92 percent efficiency, active power factor correction (PF > 0.9), heavy duty design to withstand harsh environments up to four combinable output channels, and built-in SCP, OTP, OVP and OCP protection. It is CCC and PSE certified, making it suitable for use in Japan and China. The XLD Series’ patented housing design not only saves money and time related to installation costs, but also simplifies wiring and allows for addition of accessories such as surge protection and GRE Alpha dimming modules for tuning lighting recipes. These attributes make the XLD Series an optimal element of an horticultural LED lighting system. Similarly, GRE Alpha’s SL-DIMTW Tunable White Dimming Module is a CV tunable white LED dimming module that boasts 0/1-10V control signal acceptance, smooth dynamic color temperature shifts of 2000K to 8000K, and a plug-and-play design that, depending on application situation, can create eye-catching, color temperature-changing effects without color distortion. With customized dimming curves that allow for lighting recipe adjustments and ease of control by using a simple PWM dimmer of a 01-10V dimmer, the Tunable White dimming module is a pioneer in the LED market, opening up ease of upgrade and options for color tuning applications that improve dynamics of light—elements that are important to integrating a product into an LED grow lighting system. GRE Alpha is proud to announce the addition of Japan-based Asty Corporation to its distributor list. The distribution partnership was made official in July. Asty Corporation is a leading electronics company and LED driver distributor located in Tokyo, Japan. The company prides itself on providing LED lighting solutions and professional technical support to satisfy customers’ requirements—including engineering support services, specialized LED signage, street lighting, sign-board advertising solutions, and next-generation intelligent lighting systems in the IoT industry, complete with sensors and camera solutions. "Japan is a growing market for us, and I am excited that our partnership with Asty Corporation will enable us to extend our market reach and better our service offerings to our Japanese customers," said Richard Fong, Executive Director at GRE Alpha. GRE Alpha® Electronics, Ltd. specializes in the design and manufacture of solid-state lighting power supplies and lighting control accessories—items that are the lifeblood of indoor and outdoor LED lighting systems. "GRE Alpha is committed to providing top-quality sales and engineering support to our customers worldwide,” Fong said. “I believe our partnership with Asty Corporation will greatly enhance our ability to provide better service and technical support to our customers in Japan." For more information about GRE Alpha LED drivers, dimming modules and accessories, or to speak with a GRE Alpha product expert, visit the Enquiries page and fill out the Enquiry Form. Sign up for the GRE Alpha newsletter to stay up-to-date on new products and for early access to other GRE Alpha news. For more information about GRE Alpha’s list of trusted professional distributors, visit the Distributors page. In a world where lighting management components manufacturers are constantly working to get the upper hand in innovation, collaboration, not competition, can be a great push forward. Protocols and standardization organizations like the Digital Addressable Lighting Interface (DALI) are helping to create a space in which components can work together to create stronger, more efficient LED lighting systems. GRE Alpha is at the forefront of such innovations, creating and offering DALI-compliant products that will help push the LED lighting movement into new spaces. DALI is known as the “true standard for professional digital lighting and lighting control.” A protocol set out in the technical standards of IEC 62386, DALI includes a list of parameters to be considered. These parameters include brightness and glare, color control, color rendering, light color and presence sensing, among many, many other criteria. DALI offers the only“open standard” to promote uniformity and interoperability with a range of system components, enabling systems to utilize DALI-compliant components from many different suppliers. The uniformity involved in DALI products allows companies to manufacture different elements of a system, and each element seamlessly works to support the other pieces. Because DALI’s purpose is to ensure the right quality of light in any given application setting, it is becoming increasingly important for building management systems. Leading lighting companies are launching DALI-compliant solutions for building management to offer better solutions for consumers. In fact, one such lighting company, Philips Lighting, recently listed the GRE Alpha DALI dimming module on its website. For a comprehensive list of DALI products on the market, visit DALI’s Product Finder page. Two of GRE Alpha’s products can be easily paired with existing lighting systems to upgrade them to DALI protocol compliance. These products include the SLD-DIM DALI and GLD-DIM-DALI dimming modules. 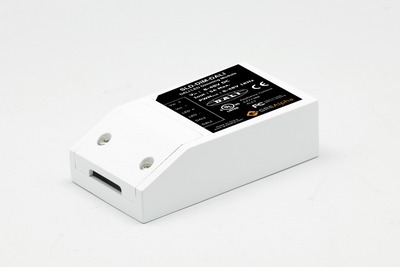 The SLD-DIM DALI dimming module offers wide-range DC input (8 to 48V), DALI control input, integrated strain relief and terminal cover, spring-loaded terminals for easy installation, 255 dimming levels, zero to 100 percent dimming range, duplicate terminals for parallel connection and up to 97 percent efficiency. The SLD-DIM DALI is Class 1 and Class 2 UL-listed, as well as FCC Class B and SELV. Designed to meet the newest standards in DALI lighting control protocol, the dimmer provides flexibility and ease-of-use for smart home lighting automation projects. Similarly, the GLD-DIM-CC DALI Dimming Module boasts constant output for dimming strips and linear lighting, add-on for GLV series independent type, easy snap-on to GLV independent type LED drivers, wide range DC input (10 to 48V), zero to 100 percent dimming range, switch and DALI versions (0-10V and 1-10V), spring-loaded terminal for easy installation in luminaires and up to 97 percent efficiency. The SLD-DALI supports constant voltage LED lighting products, whereas the GLD-DIM-CC DALI supports constant current. Additionally, the GLD-DIM-CC DALI comes with current selectable output of 350mA, 500mA, 700mA and 1050mA. As a member of the DALI organization, GRE Alpha offers DALI-compliant products that pair well with most DALI systems on the market. Several GRE Alpha products and solutions support the DALI, including the Six-in-One Dimming Module and the Seven-in-One Dimming Module. 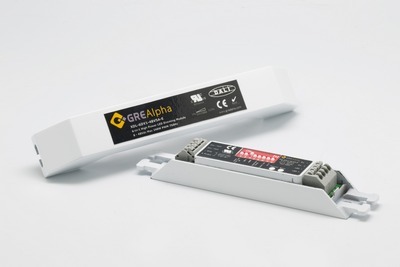 The GRE Alpha Six-in-One LED Dimming Module offers a multi-colored status LED indicator, user-adjustable linear or logarithmic dimming transfer functions, integrated strain relief and terminal cover, spring-loaded terminals for easy installation, dimming controls (switch, 0-10V, 1-10V, VR, DALI and PWM), zero to 100 percent dimming range, wide range DC input (8 to 48V), 97 percent efficiency and up to 1023 dimming channels for high resolution smooth dimming. GRE Alpha’s Seven-in-One Dimming Module is a single channel, 240W constant voltage dimming module that provides full-range, zero to 100 percent, high resolution dimming performance for constant voltage LED dimming applications. Flexible and easy-to-install, the unit comes with a multi-colored LED indicator, integrated strain relief cover and linear or logarithmic dimming characteristics that can be set for a wide variety of dimming applications. 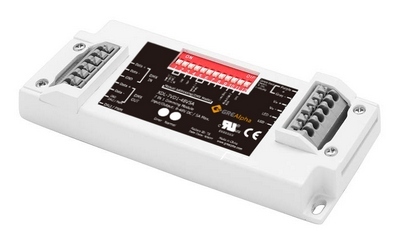 Each Seven-in-One Dimming Module comes with a built-in thermal shutdown with auto restart and overload protection. GRE Alpha recently entered an ecosystem partnership with German electrical connections and electronic components manufacturer WAGO, a leading supplier of home automation systems and interconnectors. The products partnership between the two organizations will help to simplify and connect lighting systems for building automation. WAGO offers a variety of products including rail-mounted, pluggable rail-mounted and terminal block systems, connector systems, automation components, interface electronics, marking accessories and software for the building automation, lighting technology, power and process technology, current and energy measurement technology, industry and traffic engineering spaces. Many of GRE Alpha’s products will be positively impacted by the partnership, specifically the XLD series and DALI dimming module which function well when paired with the WAGO DALI I/O module and DALI Multi Master module. The GRE Alpha XLD Series is a UL/cUL listed Class 1 and 2 easy-install LED driver offering universal AC input, integral wiring compartments for reduced installation costs, constant current and voltage dual mode operation for flexibility and optimal performance, user-adjustable output voltage and current, 1-10V dimming options with SLD Smart Dim series dimming module, up to 92 percent efficiency, active power factor correction above 0.9, a heavy duty design for harsh environments, up to four combinable output channels, built-in protection (SCP, OTP, OVP and OCP), and an IP 65 standalone enclosure. GRE Alpha’s SLD-DIM DALI dimming module features wide range DC input, DALI control input, UL/cUL Class 1 and 2 designations, integrated strain relief and terminal cover, spring-loaded terminals for easy installation, 255 dimming levels, wide range DC input of 8-48V, dimming range of zero to 100 percent, duplicate terminals for parallel connection and 97 percent efficiency. GRE Alpha works tirelessly to partner with—and make its products compatible with—the best home automation networks in the lighting industry, giving specifiers ease of mind when it comes to upgrading and specifying lighting projects with automation features. The company is committed to innovation and to delivering high-quality, leading edge LED lighting solutions. Product offerings are rapidly expanding in dimming modules, lighting control systems, and LED lighting management accessories, consistently offering new solutions to aid in LED adoption. For more information about LED drivers, dimming modules and accessories, or to speak with a GRE Alpha product expert, visit the Enquiries page and fill out the Enquiry Form. For more information about GRE Alpha’s current partnerships, visit the Partners page. GRE Alpha recently presented at the 2017 Convergent Future Forum held from June 9 to June 12 at the China Import and Export Fair Complex. A prior exhibitor at the annual Guangzhou International Lighting Exhibition event, this year the company was invited to speak about innovations in smart lighting. 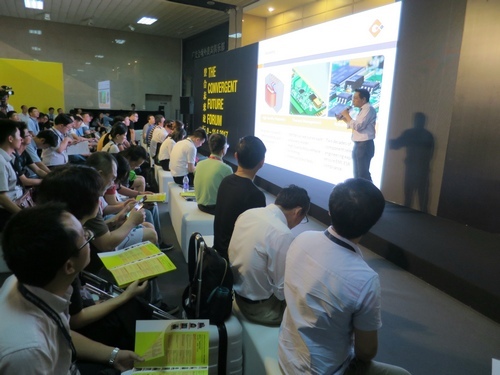 GRE Alpha’s talk, titled “Importance of Dimming Performance in Smart Lighting,” garnered a lot of attention. Mr. Kelvin Kwong, Product Marketing Manager, spoke to a packed room about GRE Alpha’s place in the new era of LED lighting: Lighting 3.0. The speech centered around adaptation to essential LED lighting technologies, applications for smart lighting, and conversion to smart LED lighting through GRE Alpha’s innovative product lines. 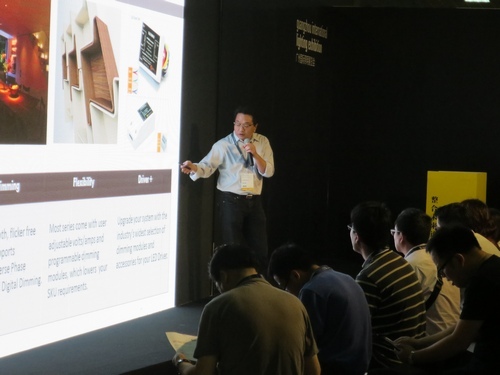 Mr. Kwong’s lecture introduced several GRE Alpha LED dimming products—including the DALI and DMX dimming modules and XLAV and XLA series of phase dimmable drivers—and explained how those products ease the process of switching to smart lighting. The products provide solutions that work with various smart lighting protocols, offering easier adoption of smart lighting technologies. In addition to presenting and allowing for audience questions, GRE Alpha was proud to support partner company Xicato Inc., a fellow LED components manufacturing firm. Xicato introduced a new range of IoT connected intelligent LED dimming modules that have high compatibility with GRE Alpha LED drivers. The four-day lighting fair hosted more than 2,300 exhibitors from more than 20 countries and regions, spanned 17 exhibition halls and covered more than 175,000 square meters of exhibition space. GRE Alpha thanks Messe Frankfurt (Shanghai) for the invitation to present at such a prestigious event. GRE Alpha is committed to innovation and to delivering high-quality, leading edge LED lighting solutions. For more information about LED drivers, dimming modules and accessories, or to speak with a GRE Alpha product expert, visit the Enquiries page and fill out the Enquiry Form.